The word gastroparesis is derived from the Latin words gastro pertaining to the stomach, and paresis, describing a type of weakness. In other words, it describes a condition in which the stomach has weak muscle movement (motility) and doesn’t empty well. It can cause several symptoms and can often be treated effectively. To understand what goes wrong in gastroparesis, let's first review how the stomach is supposed to work. In its normal functioning state, the stomach propels indigested food into the small intestine where digestion and absorption can take place. The transfer of the food requires waves of muscle contractions. The waves are triggered by an electrical current that starts in an area of the stomach called the "gastric pacemaker." Gastroparesis occurs when the stomach’s normal electrical activity stops functioning correctly or when muscles don't respond to these electrical signals. This results in slowness in emptying the food into the small intestine with resultant symptoms. About 40% of the time no cause for the gastroparesis is found. The most common symptoms of gastroparesis are bloating, belching, nausea, and feeling full after only a few bites of food. Sometimes there will be mild upper abdominal pain. Vomiting, regurgitation and heartburn can also occur. Once gastroparesis is suspected based on symptoms and history, the doctor will perform specific tests to make the diagnosis. An upper endoscopy and/or abdominal imaging studies are often performed to ensure that there is no blockage that is preventing the emptying of the stomach. Endoscopy involves passing a camera on the end of a long flexible tube into and beyond the stomach while the patient is sedated. The most specific test to make the diagnosis is a gastric emptying study. In this test, the patient eats a meal that is labeled with a tracer that a special scanner can detect. The patient’s stomach is scanned at specific intevals for about 4 hours after the meal. Normally, one-half of the solid portion of the meal should be emptied from the stomach within 90 minutes. If an underlying disease is found that is causing the gastroparesis, it needs to be treated effectively. For example, a patient’s diabetes may need tighter control or their thyroid medication may need to be adjusted. Sometimes, effective control of gastroparesis can be achieved by changes in diet. Foods that are high in fat should be avoided since they may cause a marked delay in stomach emptying. Fibrous foods tend to stay in the stomach longer and should be avoided (e.g. broccoli, cabbage). Fluids are emptied faster from the stomach so liquid supplements like Ensure or milkshakes can be used. Small, more frequent meals are better tolerated, so changing the diet to 4-6 small meals a day can work well. Each of these drugs have multiple potential side-effects. Patients should discuss possible theraputic options with their doctors to determine whichare best and safest for them. 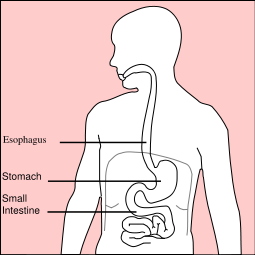 American College of Gastroenterology: Learn more about gastroparesis.